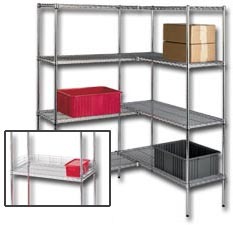 New & Used Wire Shelving | ACE Industrial Equipment, Inc.
shelving, and metal wire shelving, is the choice of many companies to handle their light storage needs since its open air design and bright finish allows for cleanliness, minimizing dirt and dust built up. The open design of wire shelving (also known as wire mesh shelving, wire shelving unit, steel wire shelving, wire display shelving, or wire rack shelving) increases sprinkler effectiveness allowing the water to flow down to the source of the fire. Whether you’re looking for a particular type of rack or you want to learn about pallet rack teardowns, we have the answers you’re looking for. For Immediate Delivery and The Best Prices Available on wire shelving unites call 1-800-300-6034 Monday thru Friday 8:00 to 5:00 E.S.T. Ace Industrial Equipment sells industrial shelving to businesses in all U.S. cities, including Oklahoma City, Biloxi, Metairie, Fort Worth, Mobile, Jacksonville, Chattanooga, Augusta, Little Rock, and Detroit.